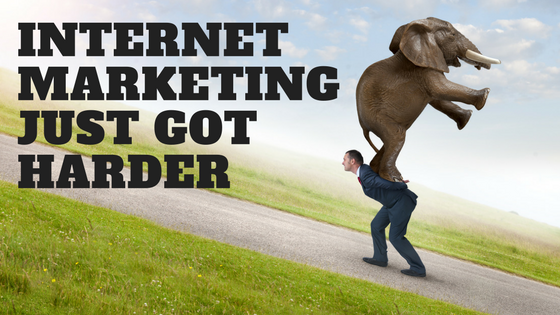 Internet marketing just got harder. Better call a professional. It doesn’t seem that long ago that we were talking about success with SEO and other Internet marketing being as simple as “optimizing” a website for good organic rank, and maybe supplementing that with a Google AdWords campaign. New customers responded and the business grew. There was low hanging fruit everywhere. These days we’re talking about lead generation, and what it takes to find new customers. It takes a lot - a good website that is not only “Google friendly,” but laser-focused on providing what the target customer is looking for, and a clear call to action to engage you or your company. The low hanging fruit has been picked. Now the hard work begins. The same thing that happened with traditional media. Once upon a time, you could buy an ad a week in the local newspaper, and new customers would show up to see what you had for sale. When radio came along, running a few ads each week on the one and only radio station would attract plenty of people to your business, more than enough to pay for the advertising. and add a little profit to the bottom line. If the experience was positive, those who showed up came back again because of the experience, with no advertising cost, and voila`- recurring revenue. Then, television came to town, then more radio stations, each appealing to a different age group or lifestyle, then cable, splintering the audiences into even smaller segments of interest. Before you knew it, businesses had to buy advertising in multiple media to reach the same audience it only took one to reach before. That's where we find ourselves again, except now its the digital media (and ironically, also still happening in radio and tv and print, etc.). For those who stay on top of Internet marketing, including Google organic and paid rank, Facebook, Instagram, Twitter, other social media and the next thing not yet identified, it’s a challenge. For business owners who already have a hundred other things vying for their time and attention, it’s practically impossible. The solution? Call a professional, someone you know, like and trust, who can help you put together a plan to execute over time (and that makes sense to you), then get started. With over 10 years of experience and hundreds of websites built - we know a thing or two about small business marketing. Ready to talk? Contact us today.